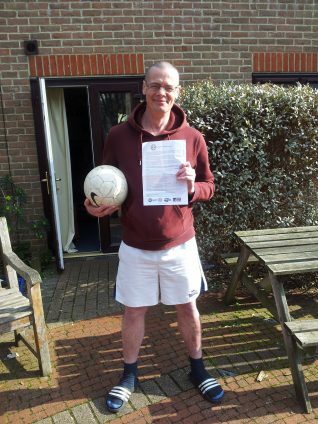 David Newbery, a client at Brighton Housing Trust’s (BHT’s) Recovery Project, has been selected to represent England in the Homeless World Cup. David will play in a tournament for Street Football Team England, in either Austria, Mexico, Portugal or Russia. The Homeless World Cup brings together over 500 players a year who have experienced homelessness from around 50 countries worldwide. David heard about the Homeless World Cup five years ago when he was living rough. He learnt more whilst attending football with Albion in the Community, the official charity of Brighton & Hove Albion Football Club. Since then David came into treatment with Brighton Housing Trust (BHT) Addiction Services, starting at Detox Support Project and progressing to the Recovery Project. David said: “Getting involved in the Homeless World Cup is an amazing privilege and opportunity for me. I hope to achieve a better level of fitness, become a better player and make new friends. My plans for the future are to successfully complete treatment with BHT Addiction Services and to continue with the 12-Step recovery programme in the local Brighton and Hove community.